In 1963, Marvel Comics debuted their response to the massive success of DC's Justice League with a super group of their own - The Avengers. Originally comprised of characters only recently introduced in the Marvel Universe, The Avengers quickly became a staple of comic book stores for decades to follow and the team as well as each individual character has spawned thousands of comic book issues, dozens of movies and television shows and a handful of trading card sets. Despite the long history of The Avengers, the super group is a relative newcomer to the trading card market. 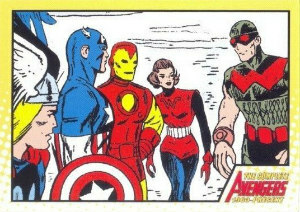 Individual characters have had their own sets and many "all-purpose" Marvel sets have devoted cards to the group, as well as its members, which makes collecting a complete set of Avengers cards a fun challenge. This guide compiles only those sets that are 100% devoted to the group, whether it be the comic iteration or the popular films, as future guides will be devoted to each individual member. With Avengers movies scheduled for release in 2018 and 2019 along with those dedicated to Captain America (2016), Thor (2017), and Ant-Man and Wasp (2018), there will be no shortage of Avengers-related card sets in the coming years. 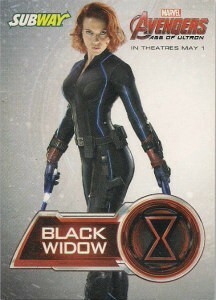 In 2009, Disney acquired Marvel and one of Disney's greatest strengths is marketing both high-end and entry-level collectibles for their franchises, so expect a great deal more on the trading card front in the near future. While there are no official announcements for future Avengers cards, with two movies forthcoming it is a safe bet that more are on their way. Becoming a collector of superhero teams like the Avengers, Fantastic Four or Justice League can be a very fun hobby as you track down every variant, relic, autograph, or chase set on the market. Collectors who decide to venture down the rabbit hole of each individual member's card sets as well as their appearances in Marvel Universe sets will find themselves on a seemingly never-ending quest to complete their collection as new cards are released every year and date back three or four decades. Although it is clearly no small task, the thrill of the hunt is why we all got into this hobby in the first place, right? Click on the images or headings to shop for cards on eBay. Links in the body go directly to product profiles on the site. The earliest card set devoted solely to The Avengers wasn't released until 2006 and is a comprehensive retrospective of the first 43 years of the comic franchise. With an 81-card base set and a healthy amount of extras, the Complete Avengers by Rittenhouse is a gorgeous set of cards that chronologically details the major events from the comic books and, ultimately, ties in with the 2006-2007 Marvel crossover event, Civil War. 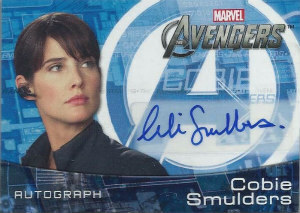 Every hobby box of The Complete Avengers includes a hand-drawn sketch card which, as Rittenhouse claims, is a first for any trading card series. 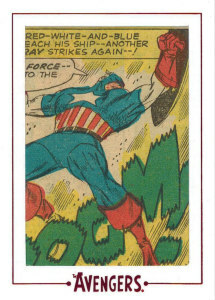 Another first for a comic-based series are a set of relic cards that include panels cut from the original ten Avengers comics. Rittenhouse calls these relics Cut Archive Cards and included them as dealer incentives. There are also three chase sets ranging in scarcity: The nine-card Greatest Enemies (1:10) chase set has original villain art work by John Czop, the 18-card Earth's Mightiest Heroes (1:20) present foil treatments of popular comic covers, and the 9-card Legendary Heroes (1:40) set honor the founders of The Avengers and are harder to acquire than sketch cards. The most rare cards from this set are the Stan Lee sketch cards which are limited to only 100. It isn't terribly difficult to track down Stan Lee sketch cards on the trade market, but they do, understandably, command a high asking price. 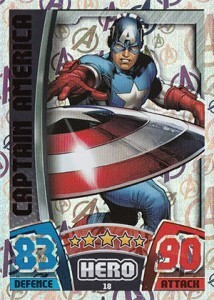 Upper Deck's first foray into Avengers cards should have been a revolutionary advancement to the medium. 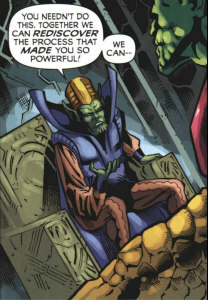 Released in 2011, the Kree -Skrull War set was actually a full-fledged comic book story with every nine cards combining to make a full page of the story. The story is based on, and in continuity to, a popular arc from 1971 and 1972, written by Roy Thomas. There are five complete stories featured in this set, with the main 20-page story (90 cards) acting as a base set and the remaining cards serving as four chase sets. In total, there are 189 cards in the complete set which equates to 42 pages of comic storylines. There are also cover cards, one to a pack, which combine to create full page cover art and very rare (1:432) sketch cards. Although this set is a conceptual high point for comic card collecting, the execution fell flat with a story that "wasn't that good" as our reviewer put it and a numbering system that was difficult to read. To coincide with the release of the first Avengers film, Upper Deck released Avengers Assemble in 2012. This 176-card set came with three hits per box: one sketch card, one single or duo memorabilia card, and one trio or quad memorabilia or printing plate. Because of the unique collation of hits, the popularity of the film, and a respectable but limited autograph list, hobby boxes for this set are harder to find and certain cards have slightly inflated asking prices but it shouldn't be hard for collectors to piece together the base set and a handful of cool hits. 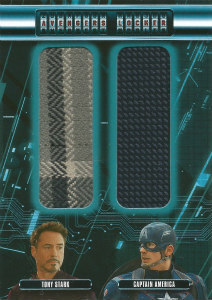 More rare with this set is the two-per-case Ultimate Panel Cards which, like the Cut Archive Cards from Rittenhouse, include embedded panels from Avengers comic books. Hand Drawn sketch Card - Marvel’s The Avengers 2011 - The Vision! 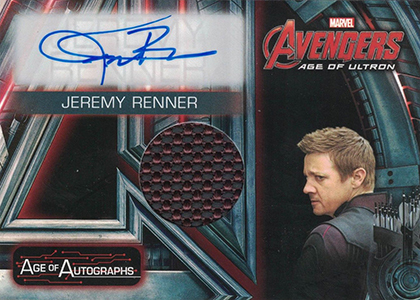 To commemorate the sequel to 2012's Avengers, Upper Deck released their 90-card Age of Ultron set. Much like their Avengers Assemble set, this collection includes a number of different relic and autograph combinations, including double and triple autograph cards. 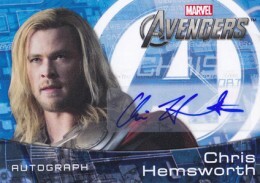 While the base set is much smaller than 2012's offering, there are a number of chase cards and variants to collect as well as the requisite sketch cards. Assembling a complete base set and all the chase sets for this collection should be fairly easy and inexpensive for completists, but tracking down autograph cards is going to be much tougher as there is no guarantee per hobby box (the only guarantee is two memorabilia cards) and it is believed that they are all hobby exclusive. Collectors would be well advised to grab any hobby boxes they can find on eBay if they're truly interested in grabbing a more impressive hit. On the comic book side of things, Rittenhouse released their second set of Avengers cards in 2015, this time focusing solely on the Silver Age comic era (1956-1970). The Avengers Silver Age is a 100-card base set with 70 chase cards and Gold (#/10) and Silver (#/100) parallels. Each box includes two Archive Cut Cards with the possibility of pulling a dual panel book card. Rittenhouse has made the focus of this set be the Archive Cuts instead of sketch cards, which fall about three per case. The quality of Rittenhouse cards is truly geared towards collectors as the card stock and designs are typically higher quality than Upper Deck and sets are a more limited quantity. This set is perfect for comic book collectors who would like a little piece of history from books they may remember from their youth. The Hero Attax cards released by Topps are not traditional trading cards but are game pieces to their popular game. The European exclusive set contains 207 cards and mixes comic imagery with stills from the Age of Ultron film, a first for an Avengers base set. Despite its continental exclusivity, this set is very easy to track down in the states via online retailers and auction sites. Because it is a card game, it is safe to assume that a good percentage, if not the majority, of the cards will be damaged or in poor condition so a die-hard Avengers collector may find great value in a complete, mint condition set when inventory has become limited over time. This oddball set is a six-card Canadian exclusive. Customers of Canadian Subway sandwich stores who ordered a meal deal would receive one of these cards free with their purchase. Once you had the card and downloaded an app on your phone, simply pointing your phone at the card would unlock custom 3D content on the surface of the card. It's a very cool promotional item and should be of interest to collectors simply for its conversational appeal if for nothing else.